Every year, approximately 1.25 million people die in road traffic crashes. In 2015, India recorded 146,133 road traffic fatalities, which means that the country accounts for over 11 percent of the global numbers. While India is home to roughly two percent of all motorized vehicles globally, its roads are some of the most dangerous in the world. Experts agree that road safety needs a safe systems approach. 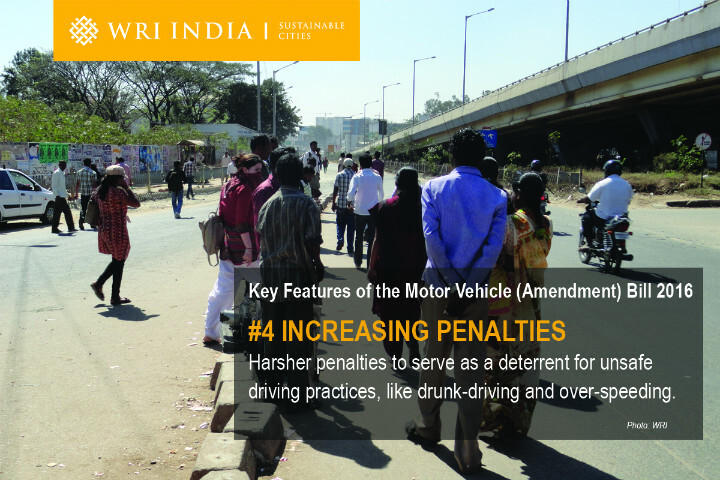 A big deterrent to this in India, however, is the Motor Vehicles Act (MVA) 1998, which prioritizes vehicles. This is soon going to change. In August 2014, the Ministry of Road Transport and Highways (MoRTH) drafted a new Road Transport and Safety Bill for public comment. Several revisions were made, but the bill still faced significant political opposition. The bill was criticized as being too revolutionary, and too top-down. In November 2015, India became a signatory to the Brasilia declaration and committed to reducing road fatalities by 50 percent by 2020. To meet this commitment, MoRTH took a consultative approach by establishing a Group of Ministers to look into the issue and get buy-in from state governments. This group decided that an amendment to the Motor Vehicles Act 1998 which upheld the key principles of the Road Transport and Safety Bill would be the best way forward. As a result, on August 3rd, the Union Cabinet, chaired by Prime Minister Narendra Modi, finally approved the amended Motor Vehicle Bill 2016. 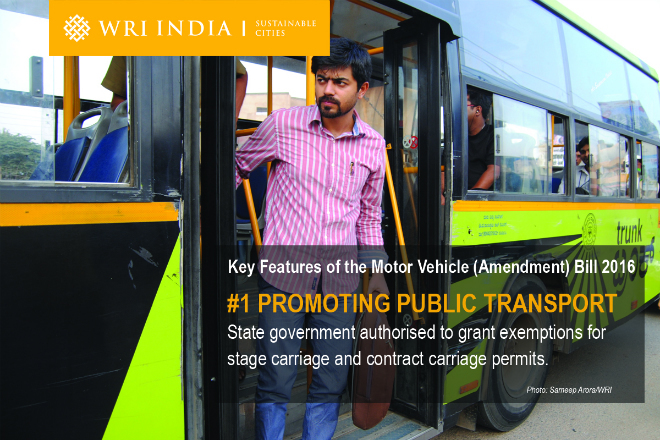 Promoting Public Transport: State governments will be allowed to grant exemptions for stage carriage and contract carriage permits in order to promote public transport services. Studies show that investments in public transport have the potential to improve traffic safety, and reduce crashes, thereby saving lives. Protecting People: The Bill puts great emphasis on the safety of children and vulnerable road users like pedestrians and cyclists. 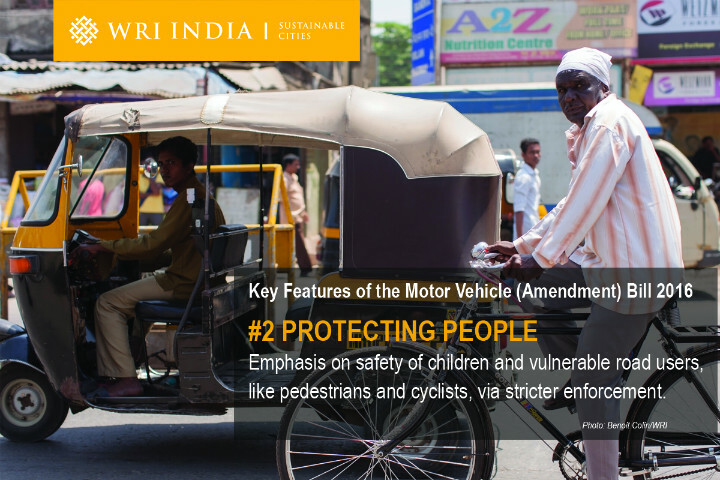 State governments have been empowered to enforce strategies for safer public spaces. 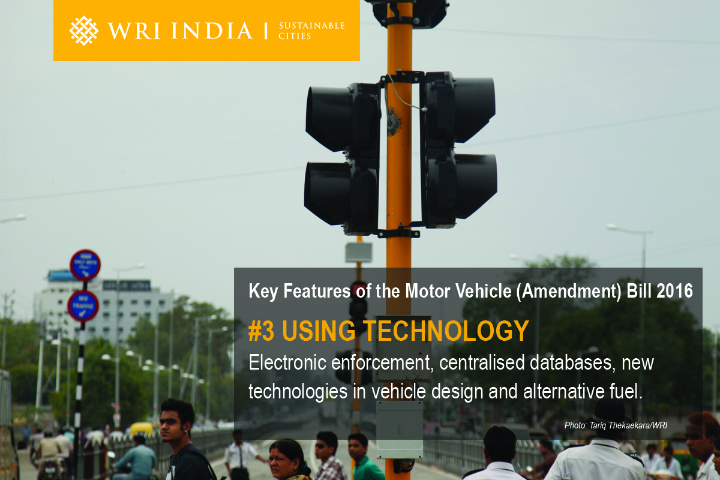 Using Technology: Electronic enforcement in high density areas, especially in cities with populations of over one million, centralized databases for issuing licenses and permits, and capitalizing on new technologies in vehicle design, alternative fuels, and retrofitting will help India keep its commitment to the Brasilia declaration. Increasing Penalties: The Bill proposes harsher penalties to serve as a deterrent for unsafe driving practices, like drunk-driving and over-speeding. This will be done via enforcement practices like a points-based system that has a co-relation between the severity of the offense with the penalty imposed, which will be a combination of fines, imprisonment, impounding of vehicles, and cancellation of licenses or permits. While the Bill is yet to be debated in Parliament, one thing is for sure, India’s roads have claimed far too many lives, and this amendment is bringing us closer than ever to having a comprehensive piece of legislation that is aimed at positively impacting traffic safety. 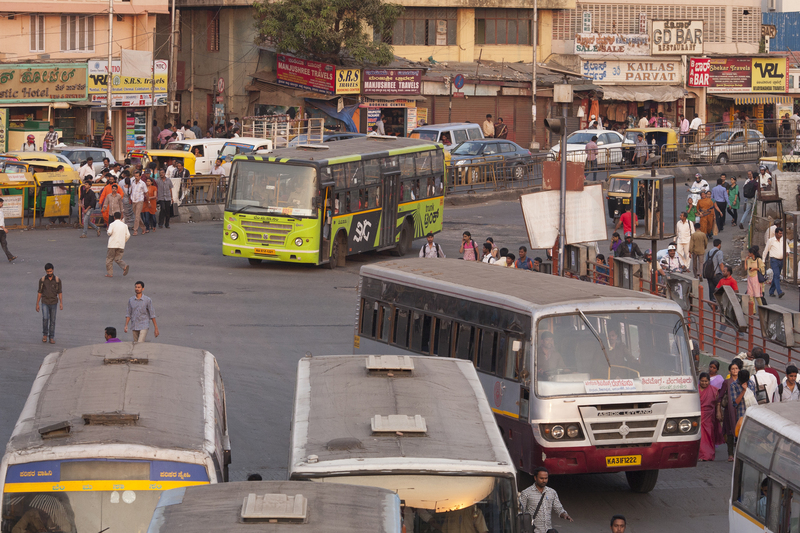 Inclusive Planning: How Can Indian Cities Lead the Way?